Swedish massage is the most popular form of massage in the west, and for a good reason – it is highly effective at inducing relaxation whilst reducing muscle pains and improving mobility. Swedish Massage was developed in the nineteenth century by a Swedish Psychologist, drawing on long proven techniques originally used in classical times. The massage is applied with firm but gentle pressure which helps to increase oxygen in the blood and disperse toxins from the muscles. This has many beneficial effects, from easing muscle ache to improving lymphatic drainage. Above all it induces a sense of deep relaxation, which is a great way of dealing with stress and gaining a heightened feeling of wellbeing. A variety of techniques are used in Swedish massage, such as circular movements, tapping, kneading, gliding strokes and so on. They are applied with a light to medium pressure combined with the use of oil to assist the movements of the hands. The massage begins with slow, soft strokes, then moves on to deeper movements to work out tension. The process is not painful and by the end of it you should feel extremely relaxed with a great deal of stress removed, both from your body and your mind. The effects of Swedish massage are so positive and the process so natural that some people choose it simply for the pleasure of feeling so relaxed and loose-limbed. But it is also an important therapy for people who have problems with blood circulation, muscle spasm or mobility. 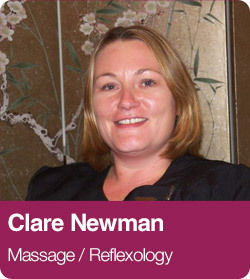 If you think you might benefit from seeing our professional massage therapist, why not give the clinic a call?